Steelstown Ladies crowned 2015 Ulster Junior champions! Steelstown players and manager celebrate becoming Ulster Ladies Junior Football champions after defeating O'Neill Shamrocks from Monaghan in Sunday's final. Steelstown Brian Ogs’ Senior Ladies will meet Munster champions, Bantry Blues, in the All Ireland semi-final on November 22nd after over-coming O’Neill’s Shamrocks to become the 2015 Ulster Ladies Junior Football champions. Never renowned for making things easy for themselves, the Brian Ogs girls were forced to defy driving wind and torrential rain before eventually seeing off the Monaghan champions by three points in a gripping final in Killyclogher on Sunday. Despite playing with the strong wind at their backs for the opening half, the Steelstown girls trailed by a point at half-time before producing a superb second half hour to hold the Shamrocks scoreless and bring a first provincial title back to the Ballyarnett club. Captain Emma Doherty, who claimed all seven of her team’s point, and first-half goalscorer Ciara McGurk were the players on target but everyone in blue and yellow played their part according to the delighted Brian Ogs manager, Thomas Cusack. 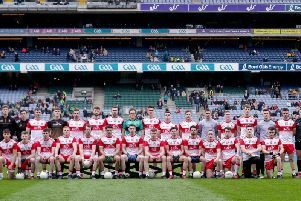 “We did it the hard way but that is just typical of this team,” said Cusack, “We could have made things much easier had we played in the first half the way we did in the second but come the final whistle we didn’t care, everyone was delighted. Steelstown captain Emma Doherty receives the Ulster Junior Championship trophy in Killyclogher on Sunday. Steelstown had the wind at their backs in the first half but the sodden surface proved troublesome in a poor start. The Derry girls had conceded 1-01 within five minutes as Muireann Atkinson got her side off the mark with a free before a cross-field ball found Shamrocks danger-woman Danica Tavey free on the edge of the square. As the ball dropped, Tavey was able to gather, turn and shoot powerfully past Emma McCallion to complete an ominous opening. But this victory was as much about character as ability and a few minutes later, the inspirational Doherty got her side off the mark with a trademark free. Niamh Brennan restored the Shamrocks’ four point lead before Steelstown struck on 10 minutes. Again Doherty was instrumental, dropping a free just short of the posts which led to confusion in the Shamrocks defence. The Monaghan hesitation allowed Ciara McGurk to steal possession and smash the ball into the net from a yard out to bring her side right back into the game. All these girls can say they are an Ulster champion which is something to be proud of. Steelstown levelled moments later as ‘Player of the match’ Doherty fired over another free but after the period of Brian Ogs dominance, the Shamrocks began to pick up the pace again. Sinead Mohan, in for injured captain Michelle Carragher, showed good strength to point before Tavey added to her tally with a free. Doherty responded with a free of her own to bring the deficit back to a single point at 1-04 to 1-03 going into the break. “After the first half and having played with what was a really strong wind, we were behind by a point but the girls deserve so much credit for the way they played second half,” added the Steelstown manager. “I was worried about the strength of the wind but what gave me confidence what that I knew the team hadn’t started to play to anything like their normal standard. “Once they went out and won the throw-in for the second half and went straight at the Shamrocks, I knew we were in for a better performance. The fact we kept a very good team scoreless against a very, very strong wind tells you everything. The girls pushed them back, kept the pressure on and in the end deservedly got the win. The second half was slow to start and both sides were guilty of some wasteful wides. With 50 minutes on the clock, a free from Shamrock’s Sorcha McCague dropped short in a replica of the move that led to the Steelstown goal but the Brian Ogs were able to scramble clear. A few minutes later, Doherty displayed her true leadership qualities to finally bring her side level with a massive score. It turned out to be the best period of the game for Steelstown, as Doherty went on to add three further points from frees and put the pressure firmly on the Monaghan team. It was a physical game throughout, and on 55 minutes in, referee Yvonne Duffy was forced to hand out a yellow card to Steelstown’s Katy Holly. The final moments saw O’Neill Shamrocks lay siege to the Steelstown goal in search of the goal that would save them but the Steelstown defence stood firm. As the referee blew the final whistle, there were ecstatic scenes from the players and the hundreds of travelling Steelstown fans. Captain Emma Doherty echoed her manager’s comments, saying they deserved the win after a tough start. Next up for Steelstown is that All-Ireland semi-final which has provisionally been pencilled in to take place in Offaly and Brian Ogs coach, Brian Williamson, said the city girls have nothing to fear. Steelstown Brian Ogs: Emma McCallion; Lea Casey; Ruagin Doherty; Aoife McGough; Dearbhla Wilson; Katie NicAindreis; Roisin Laverty; Aoife Laverty; Orla Flanagan; Katy Holly; Michaela Wilson; Emma Doherty (0-7, 5f); Ciara McGurk (1-00); Lea McCready; Megan Devine. Subs: Rachel Roberts for Dearbhla Wilson; Beth Heaney for Michaela Wilson; Enya Doherty for Ciara McGurk; Lea Casey for Lea McCready. O’Neill Shamrocks: Sorcha McDonald; Niamh Kieran; Lianne Ward; Niamh Kerr; Sophie Brennan; Emma Kerr; Rebecca Malone; Muireann Atkinson (0-1f]); Hannah McSkeane; Niamh Tibby; Michelle Kerr; Sinead Mohan (0-1); Danica Tavey (1-01); Niamh Brennan (0-1). Subs: Ailbhe Boyle for Niamh Kerr; Ursula Treanor for Niamh Tibby.